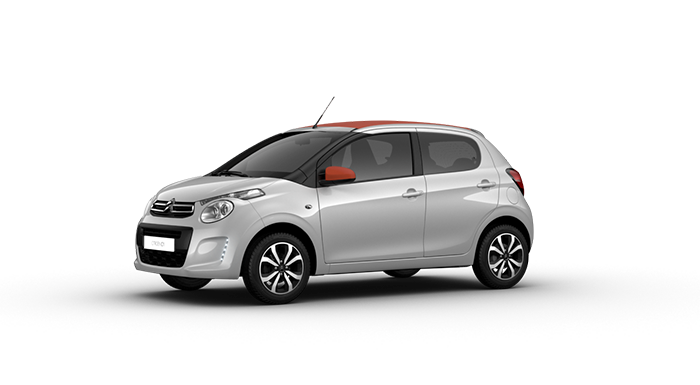 Sassy and stylish, the New Citroën C1 is the ideal city runaround. Choose from three- and five-door versions and a brand new convertible style called Airscape. Images contained on this page are for illustrative purposes only and may not reflect the full Citroën range available in Ireland. 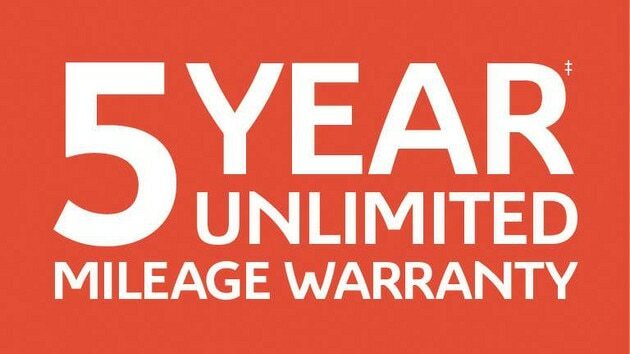 When you buy a new Citroën C1 you can relax with the knowledge that it comes with a comprehensive 5 year* – Unlimited Mileage Warranty covering any manufacturing defects that may arise, helping you enjoy care-free motoring in your new Citroën. The New Citroën C1 is a city car with dynamic lines, original styling and a chic, urban design. Visual continuity between the windscreen and side windows gives the C1 car a distinctive, modern look. Choose 14’’ or 15’’ wheel covers and super-swanky 15’’ diamond-tipped alloy wheels for an ultra-impressive finish. The New Citroën C1 catches the eye with eight body colours and daytime-running LEDs - a clear sign it's part of the new Citroën family. The vertical lights create an upbeat, hi-tech light signature that showcases the car's sassy style and innovative character. 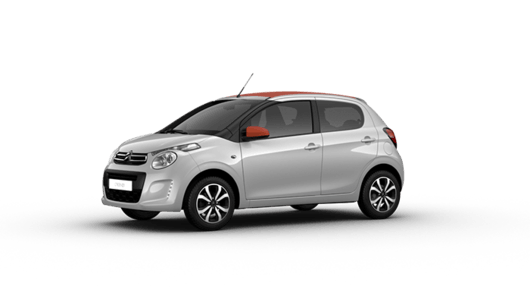 The New Citroën C1 is available in eight exterior colours (Caldera Black, Gallium Grey, Carlinite Grey, Tapenade Grey, Lipizzan White, Smalt Blue, Scarlet Red and Sunrise Red) and can also be personalised with bi-tone colour options. The soft-top version, Airscape, is also bi-toned. Contrasting with the body colour, the soft top is available in a choice of three colours: Sunrise Red, Black or Grey. The New Citroën C1 is cheerful and upbeat on the inside too, with bright trim colours and door panels that match the body colour. You'll love the sleek lines and clean design of the dashboard. Bold flashes of colour liven up the multimedia panel, air vent trim and gearlever base. The New Citroën C1 gives you an enjoyable, comfortable and relaxed driving experience on all types of road. Benefit from smooth suspension, a sure-footed drive and a car that holds the road brilliantly. With its neat dimensions and nimble handling, the C1 is the ideal city car. The New Citroën C1 car puts safety first. It comes with six airbags (front, side and curtain) and an ESC system to keep you safely on course if it loses grip. Power steering, a speed limiter and tyre pressure monitor let you enjoy a relaxed, comfortable drive both in the city and on the open road. The New C1 car is extra easy to use thanks to cutting-edge technologies like the 7 inch Touch Drive interface and reversing camera. The New Citroën C1 uses intuitive technologies to make life beautifully simple. You'll love the 7 inch colour touch screen in the middle of the dashboard - this lets you easily control the on board computer and all media functions like the phone and audio. 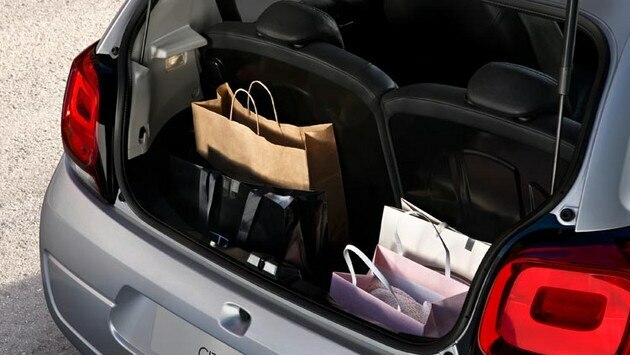 Handy driving aids like the reversing camera means you can relax with your New Citroën C1. The reversing camera projects images onto the 7 inch Touch Drive interface whenever you reverse - so you can squeeze into tight spaces with no worries. 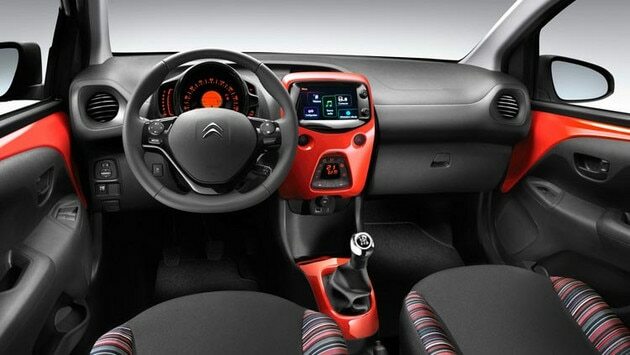 The New Citroën C1 now comes with modern, speedy keyless entry and start. Start your car without even needing the electronic key. Often handy in city driving, for example in underground car parks, Hill Start Assist is another great feature fitted as standard in the New C1. It holds the car steady for two seconds for an easy start on slopes with a gradient of over 3%. Economical and eco-friendly: with the e-VTi 68 Airdream engine, a five speed gearbox and featuring stop & start technology, the New Citroën C1 is on a par with the best for fuel consumption at 74.3mpg on the combines cycle and CO2 emissions of 88g/km. Extra economical and eco-friendly with even greater performance: choose the C1 with the new VTi 82 from the PureTech engine family. This 1.2-litre, three-cylinder petrol engine generating 82 bhp uses innovative, efficient technologies to give a fuel consumption of 65.7 mpg and CO2 emissions of 99g/km, along with powerful driveability and performance. 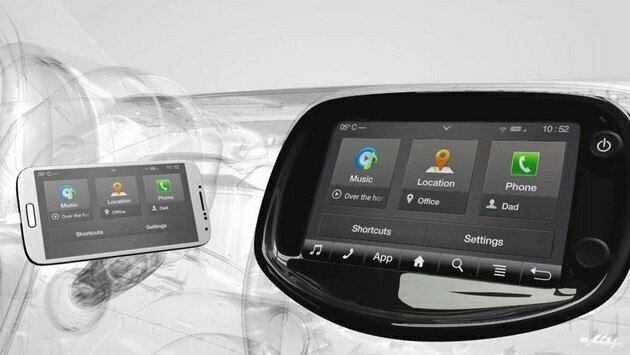 Mirror Screen technology lets you control your smartphone from 7 inch Touch Drive interface of the New Citroën C1. Check the compatibility of your smartphone, install the data exchange app and plug it into your car’s USB port. You can easily access and control the full range of MirrorLink and AppinCar compatible apps from the 7 inch Touch Drive interface: navigation, phone, address book, music, web radio - and any other useful driving apps.